I know wifi is not great on Toppys, but maybe someone will be able to use this. It came with my 2400 and I have never used it. There is a CD and an installation pamphlet in the box. Free to a good home. Just pay for postage. I can just send the dongle if you don't want the box and CD. The CD is for use with PC. The drivers are in the Toppy firmware. Not all firmware versions support all of the wifi adapters. I think these dongles have the RT2770 chip sets in them and they work fine on PC's (with the drivers on the CD). 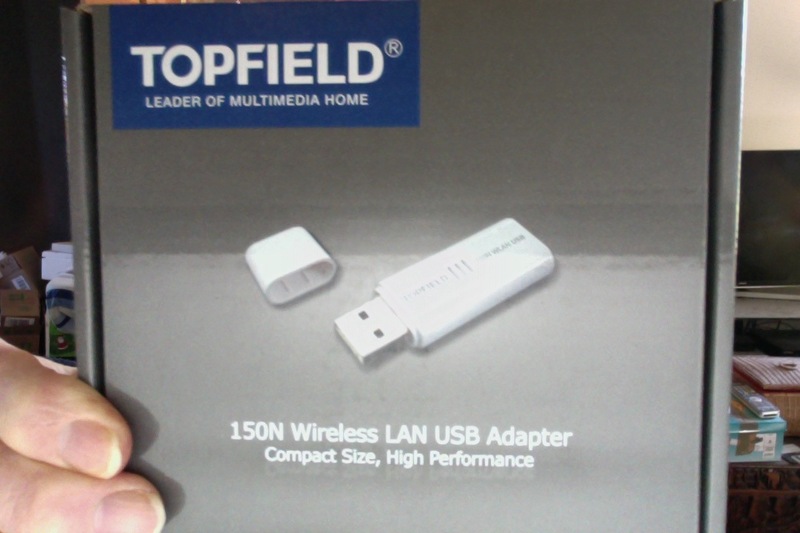 I wonder if this dongle would work on a trf 2460. My 2460 is still working after heating up the BGA chip with a blow torch (trial fix for scrambled error issue!). If it has recent firmware it should work. I just have a curiosity in the WIFI functionality of the toppy, especially as the dongle uses the somewhat dated RT2770 chipset. I'll check what firmware is loaded on this toppy. At the same time I'll see again if the BGA chip is still fully connected (kind of expect it to fail but it keeps hanging on!). Some time (several years ago) I got one for under $10 delivered. I know its just a couple of bucks to send the dongle only - no problem with that except I haven't any "digital transfer" capacity.